Kitchens are one of the main selling points of a home. It’s a gathering point where families reflect and bond after a long day at work and school. Modern kitchen designs can facilitate the preparation of delicacies for your loved ones to enjoy and masterpieces when you entertain. If your kitchen isn’t a room you love spending time in, perhaps you should consider a few new kitchen design ideas. 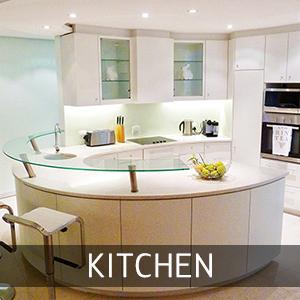 Kitchen renovations are a great way to bring some modern designs into your existing space. Many people are choosing flat-panel cabinets, stainless steel appliances, marble or granite countertops, beautiful splash backs, islands and ceramic floors. Since all of these design elements are available in an assortment of colours and designs, we can control your new kitchen look. Our key for incorporating the kitchen with the rest of the home, is to make a bold statement that highlights the space and makes it a focal point. We’ll help add a touch of personality to modern kitchen designs that make your kitchen feel more open and bright. The contemporary kitchen is about more than just individuality and looks, the kitchen needs to be functionally satisfying and aesthetically pleasing to contribute to a smooth workflow. Speak to our team for innovative kitchen design ideas and see what brilliant designs can be brought to life in your new kitchen.